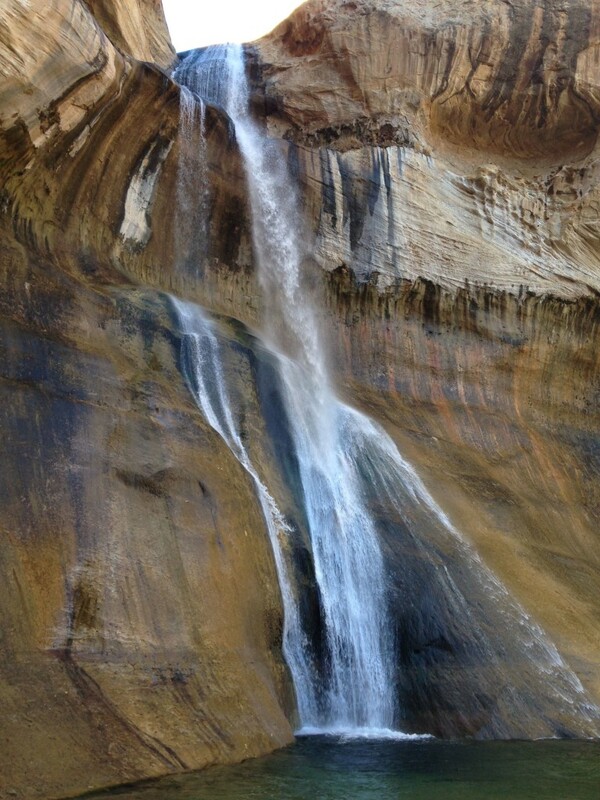 The Lower Calf Creek Falls can be accessed by a 6-mile round trip dirt and sandstone hiking trail, which begins from the Calf Creek Recreational Area within the Calf Creek Campground off state Route 12, also known as Highway 12, located approximately 11 miles south of Boulder Town and 15 miles east of Escalante. Access to the campground is well marked from the highway and is open February through the late fall months with a $5 per day fee or a $15 overnight camping fee implemented by the Bureau of Land Management which manages lands within the national monument. 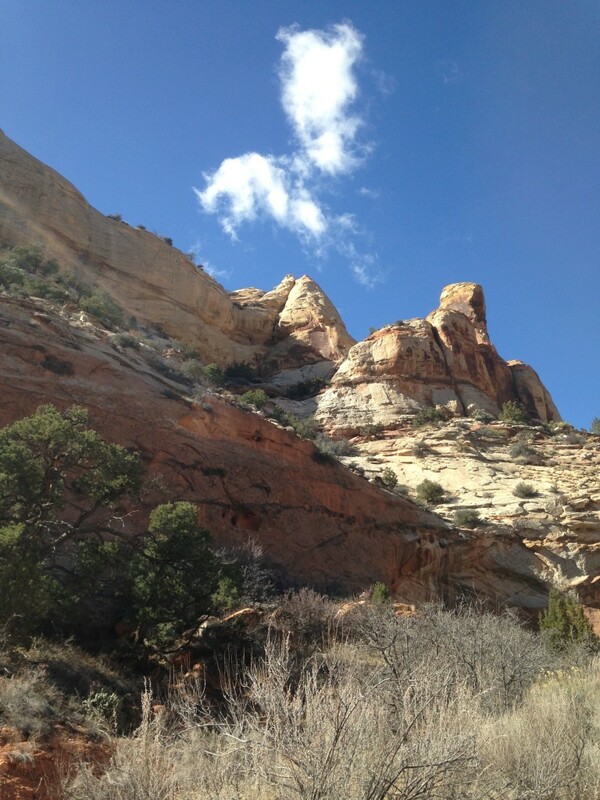 The campground includes 13 sites surrounding the Calf Creek, which runs south through the canyons before flowing into the Escalante River. 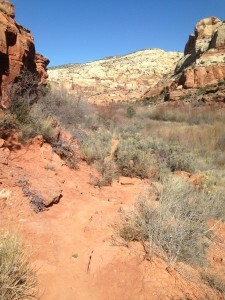 The point-to-point trail leads north after a mile of running parallel to Calf Creek through the canyon and Highway 12 above the canyon. At an elevation of 5,400 feet above sea level, the trail is easy for hikers to walk or run through white sand and over sandy rocks. Glimpses of Anasazi and Fremont Indian civilization, including pictographs, or rock art, and structural remains estimated to be 800- to 1,000 years old, can be seen along the way, as well as plenty of cacti, cedar trees, and bamboo. Depending on the time of day you hike into the canyon, your eyes can explore the canyon in different ways. Early to midafternoon hikes will showcase the sun crawling down the rocks. Night or midnight hikes will take away the heat of the day – even better when the moon is full and bright, shadowing through the canyon walls and dancing across the creek water alongside the trail. At the end of the trail, a cascade pours into an 8- to 10-foot pool that swimmers may enjoy, with greenery and trees surrounding it along with sand rock canyon walls. On a hot day, water that can be around 52 degrees may be just the refreshment you need. 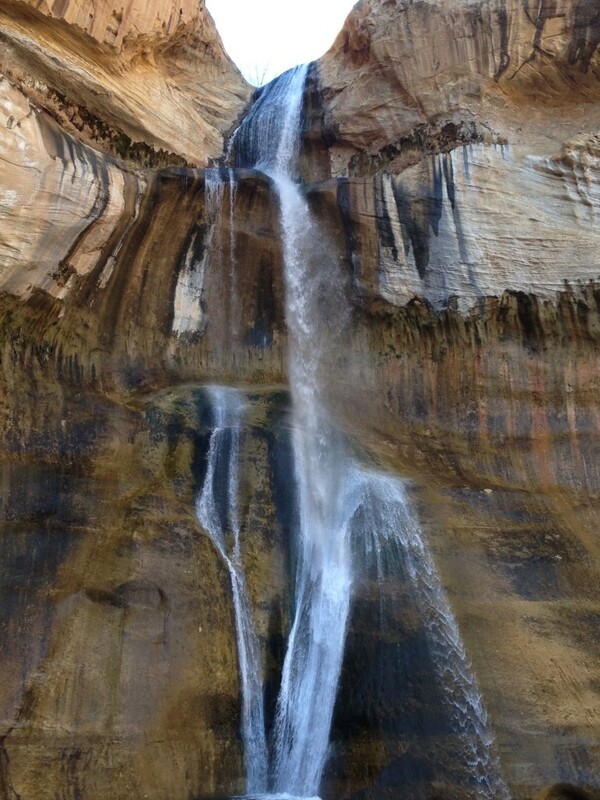 The Upper Calf Creek Falls, an 88-foot waterfall, can be accessed 3 miles south of Boulder Town off Highway 12. Further information for hiking can be found here. Hiking time: Approximately one hour up and one hour back. Elevation gain: 250 feet from the trailhead to the falls. 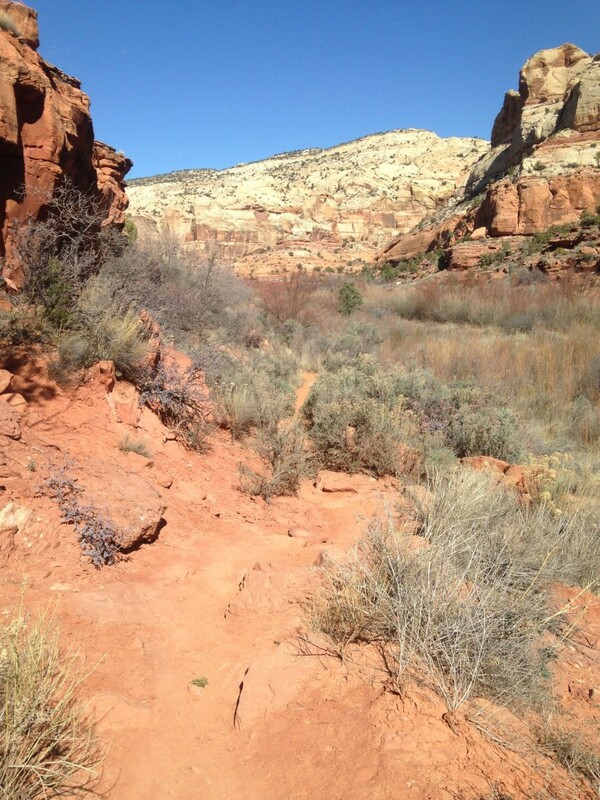 Trail characteristics: The hike has slight climbs along some sand rock. 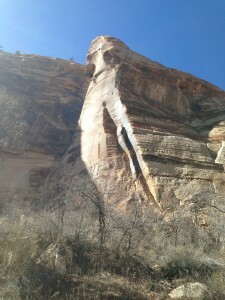 Mostly smooth sandstone with some intermittent natural steps to maneuver and a sandy dirt trail. Restrooms and picnic tables are available at the recreational area. Hikers are advised to be courteous and pack out the garbage they bring in on the trail. The trail is pet friendly but dogs must be leashed. Remember to carry plenty of water and at least basic safety gear when hiking. Carry at least two liters of water per person. In the heat of the day, the length can draw much thirst. See hiking safety tips here. This is a dry desert environment. 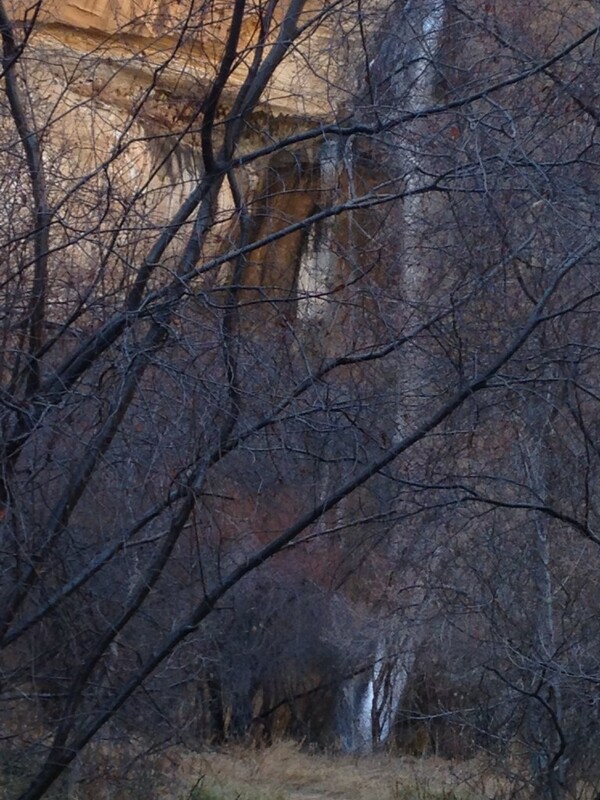 The Upper Calf Creek Falls is another addition to the view of the cascading Calf Creek as it runs 7 miles.